McCauley Mountain Ski Center is open an average of 105 days per year. McCauley Mountain is located in the Town of Webb, Herkimer County, New York. It is located just outside the hamlet of Old Forge, in the central Adirondack Mountains. Opened in 1958, the summit of McCauley Mountain is at an altitude of 2200 feet. 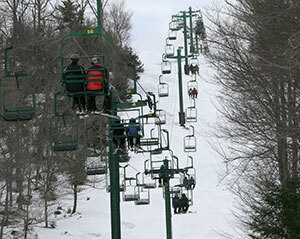 The mountain features a 633 foot vertical drop, 21 ski trails up to 5,000 feet long, two T-bar tows, two rope tows, and one double chairlift. 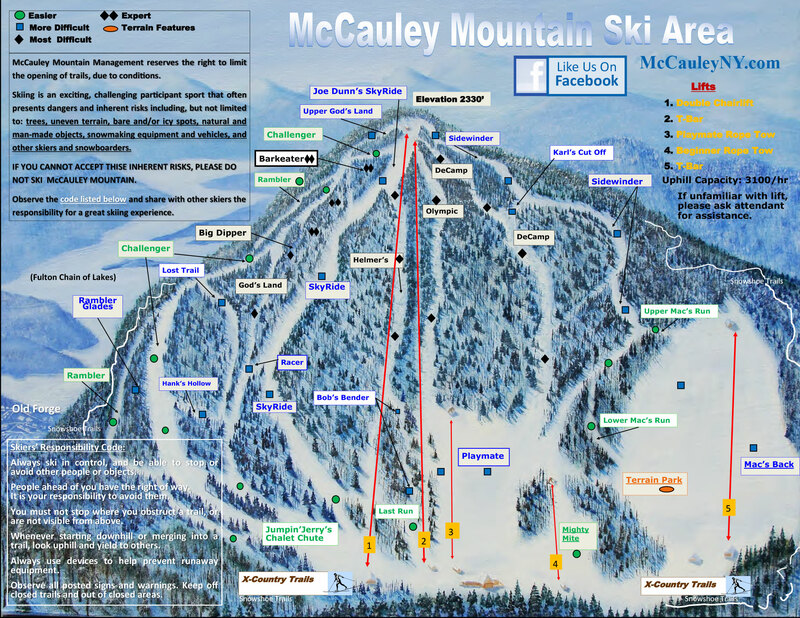 Great features at McCauley Mountain include top-notch grooming, designated bump runs and glades for intermediates and experts, double black diamond runs, and easier trails from the summit. Yes, at McCauley newer and more conservative skiers are not relegated to the bottom of the mountain. The easier trails from the top give those skiers and snowboarders views to the High Peaks from up in the skiers' alpine world. Free WiFi is available in the chalet. You will need the latest version of Adobe Acrobat Reader to view. McCauley is home to three Olympic skiers: John "Louie" Ehrensbeck (1964, 1968) Hank Kashiwa (1972), and Maddie Phaneuf (2018). Louie is at McCauley almost every day at his "Louie Olympic Tune" business. Many other young skiers have grown up on McCauley's diverse terrain, and have gone on to compete with the U.S. Ski Team and work with ski schools at world renowned resorts.